This is The Morning Shift, our one-stop daily roundup of all the auto news that's actually important — all in one place at 9:30 AM. Or, you could spend all day waiting for other sites to parse it out to you one story at a time. Isn't your time more important? 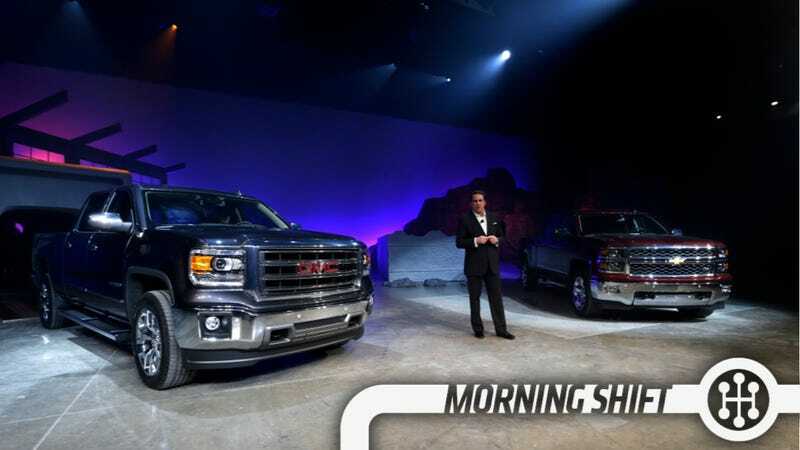 The 2014 Silverado is a big deal for truck buyers and a bigger deal for GM, whose goal of reaching higher profitability depends on getting the right price for their, in theory, most profitable vehicle. The Ram Ram and Ford F-150 are getting older, and thus they have a bunch of 2013 products to push out the door at much lower prices. Automotive News has the full story, but the important part is you can get a similar Ram Ram or Tundra or F-150 for much cheaper. Dealers are desperate for a little cash on the hood so they can move these trucks, with supplies at certain Texas dealers hitting 120-to-170 days. GM wants the dealers to sell the new Sivers and Sierras based on their merits, which is hard to do when the dealer next door will give you an admittedly inferior Nissan Titan for two boxes of EasyMac and a smile. Discrimination is still common in lending practices and the Consumer Financial Protection Bureau is clamping down. Or, rather, they're making banks send what Bloomberg is calling 'nasty grams' to dealers. The guidance takes aim at a practice the agency refers to as "dealer mark-up" and auto dealers call "dealer-assisted financing" or "dealer reserve." Under the system, banks function as indirect lenders, allowing dealers to add points to the interest rate and pocket the difference. The consumer bureau said that one way for lenders to comply with guidance would be to pay flat fees to dealers instead of varying interest rates. Consumer groups, including the Durham, North Carolina-based Center for Responsible Lending, charge that the financing practice gives dealers an incentive to move buyers, including members of minority groups, into more-expensive loans. In a statement issued after the bureau's guidance, the dealer association said indirect lending is "convenient and competitive" for consumers and said the agency was basing its theories about discrimination on unreliable statistical methods. The full-sized Hyundai Genesis sedan is a nice value and an attractive, albeit unremarkable, choice for someone looking for a comfortable luxury vehicle. Unfortunately, the AP is reporting that anyone who owns one of the 40,000 or so cars better keep an eye on the brakes. The agency has received 23 complaints of that drivers had to push harder than normal on the brake pedal to make the car stop. One driver crashed into a stopped vehicle while another had to use the emergency brake to stop, sending the car into a spin. If you happen to be heading towards a nitroglycerine factory while transporting a load of fireworks and are unable to stop in time… yada yada yada… fiery death. Several UAW officials and other UAW insiders told the Free Press that Williams is widely viewed as a leading candidate to become the union's next president because of his achievements as regional director, the respect he has earned over the last four years and his ties to the administration of President Barack Obama. In addition, Williams has played a key role in the UAW's organizing efforts with Asian and German automakers. In 1989, Williams negotiated the union's first contract with Mitsubishi Motors at the company's Normal, Ill., plant. He also was part of the team that negotiated contracts with Caterpillar in 2011 and 2004. In 2007, Williams played a central role in then-Sen. Barack Obama's upset win in the Iowa caucuses that launched his successful presidential candidacy, according to his official UAW biography. Everyone focuses on batteries with EVs, but much of the costs are in the 'power electronics box' that converts DC from the battery to AC for the electric motor/s. As Karl Henkel reports, this is a huge cost second only to the batteries to themselves. For instance, Ford has reduced the number of battery cells — which together comprise a battery pack — in its hybrid vehicles from more than 250 in the last production model of the Escape hybrid (discontinued in 2012) to just 76 in the new C-Max and Fusion hybrids. But increasing efficiency of the battery is only part of the story: The power electronics box is responsible for transferring as much of the current as possible without wasting or losing energy. Ford's most recent production-ready box transfers 93 percent of the energy. "You want a box that is really efficient," Sankaran said. "Otherwise in every process you're losing energy." On this day in 1929, the 50th birthday of the incandescent light bulb, Henry Ford throws a big party to celebrate the dedication of his new Thomas Edison Institute in Dearborn,Michigan. Everybody who was anybody was there: John D. Rockefeller Jr., Charles Schwab, Otto H. Kahn, Walter Chrysler, Marie Curie, Will Rogers, President Herbert Hoover—and, of course, the guest of honor, Thomas Edison himself. At the time, the Edison Institute was still relatively small. It consisted of just two buildings, both of which Henry Ford had moved from Menlo Park, New Jersey and re-constructed to look just as they had in 1879: Edison's laboratory and the boarding-house where he had lived while he perfected his invention. By the time the Institute opened to the public in 1933, however, it had grown much more elaborate and today the Henry Ford Museum (renamed after Ford's death in 1947) is one of the largest and best-known museums in the country. Neutral: Which New Truck Would You Buy?